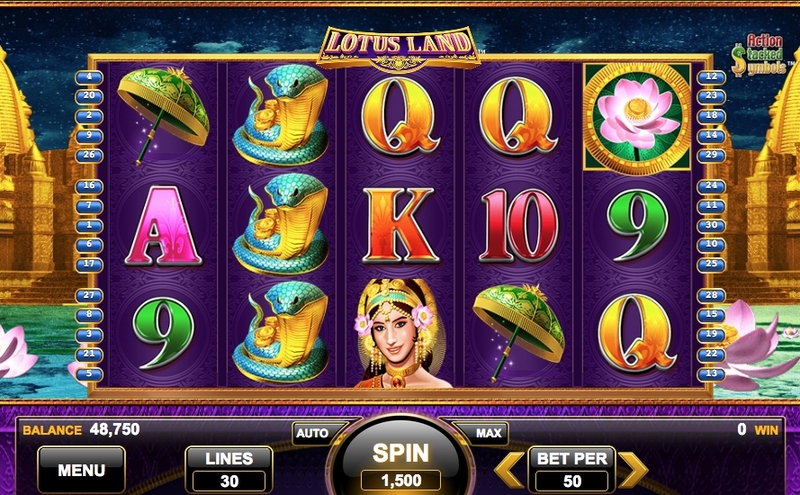 Lotus Land is a rare Indian-themed slot, which is baffling to think there are so few when you think of just how many Oriental-themed slots that are out there. Like several other online slots from Konami, this game started life in land based casinos. It joins other titles like China Shores and Jumpin' Jalapenos, which have proven to be huge hits with online players. With a name like 'Lotus Land' you would expect gentle sounds and plenty of peace lilly's and that is almost exactly what you get. As slots go this one has plenty of tranquil noises and is packed full of colourful icons. So, will this Lotus Land take our bank balance to a higher state or will we fall into a deep trance? 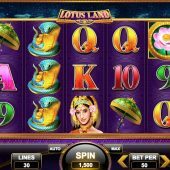 Those players that have played plenty of Konami slots before will know that Lotus Land is very similar to their Gypsy Fire game in paytable and rewards. The game has the standard 5 reels, with 3 rows and 30 paylines in total. The highest paying symbol is the Tiger at 200 coins for 5-of-a-kind (5OAK), followed by the Indian girl at 150 coins, Elephant and Cobra at 100 coins and the umbrella at 80 coins for a 5OAK. The card symbols A-K-Q-J-10-9 make up the remaining standard reel positions offering between 50 - 30 coins for a 5OAK. The symbols in Lotus Land are quite often stacked, offering more winning possibilities. Like some previously mentioned slots the big wins in Lotus Land slot appear to be loaded into the bonus feature. Landing 5 of the Lotus Scatters will reward you with 600 coins before you even start your free spins. However, as we all know, this is a very rare hit. As previously mentioned a lot of the rewards in Lotus Land are packed into the free spins feature, with 8, 12 or 20 free spins available for 3, 4, or 5 lotus flower scatters respectively. The big benefit in this feature is that it can be retriggered with any 2, 3, 4 or 5 scatters, awarding 5, 8, 12 or 20 free spins - something we have seen before in Buffalo slot from Aristocrat. During this feature the Wild sphere symbol will be replaced with multiplier of between 2x - 5x, which can be multiplied together. It is also worth noting that this Wild symbol can be stacked, so the potential rewards are huge.